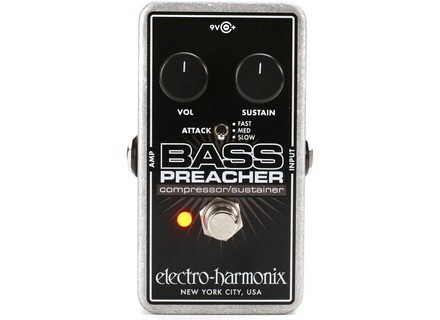 Bass Preacher, Bass Compressor/Limiter from Electro-Harmonix. 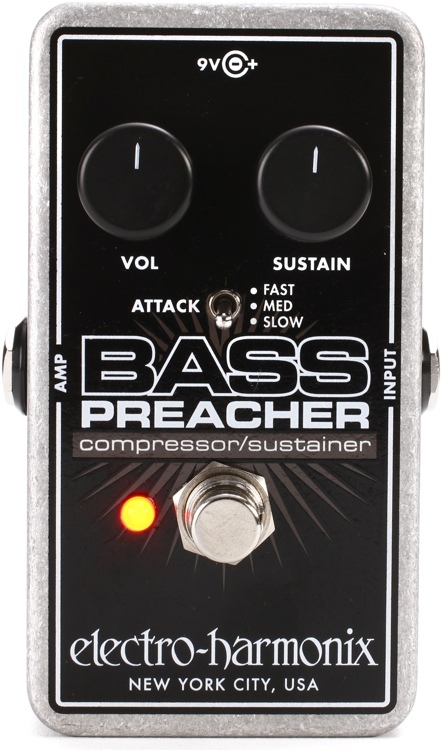 Electro-Harmonix has introduces the Bass Preacher, a compact compressor/sustainer stompbox designed specifically to deal with the powerful low frequencies and massive dynamic range produced by modern bass guitars. The Bass Preacher’s input sensitivity ranges from -10 dBu to +2 dBu, hence fitting for both passive and active basses of varying output levels. Its Sustain knob controls the amount of compression, and the pedal features an Attack toggle switch that changes the timing of the onset of compression. Three selectable settings are provided: Fast, Medium and Slow. In Fast mode the compression engages immediately and produces an intensely squashed sound; in Slow mode, the compression engages more slowly, allowing more initial transients to come thru ; as for the Medium mode, it is a compromise between the two attack envelopes.The Bass Preacher produces a maximum gain reduction of -21 dB, and its Volume control lets the user adjust the amount of makeup gain to cut, match or boost the outgoing signal in relation to the incoming one. The Bass Preacher features true bypass switching and is powered via a 9V battery or an optional EHX9.6DC-200mA power supply. The pedal carries a U.S. List Price of $105.50 and is available now. More details at Electro-Harmonix's website, or directly from them at the NAMM (Booth #5396).